Come and meet us at Indigo in Utrecht Jaarbeurs. See you there! ProRoad has been released and available for download on the Unity Asset Store! ProChart 1.3 with stacked bar chart and CurvedUI support is available now! Good news for Linux users. We support Ubuntu 64 bit. Have fun on Linux too! This morning, after so many years of planning and development our Revhead is finally born! We loved the whole process even it was really hard sometimes. We did our best to make the game we missed from the market, and hopefully You will be very happy with it! We won't stop. Just keep going and working further to make it better and better. From today Revhead is available in Steam Store. Have fun! ProChart 1.2 update is available on the Unity Asset Store, with new label feature. It is now possible to use labels on values and axes in canvas charts. Our game seeks votes on Steam Greenlight. 2016 has been a busy year. We proudly present our new trailer! 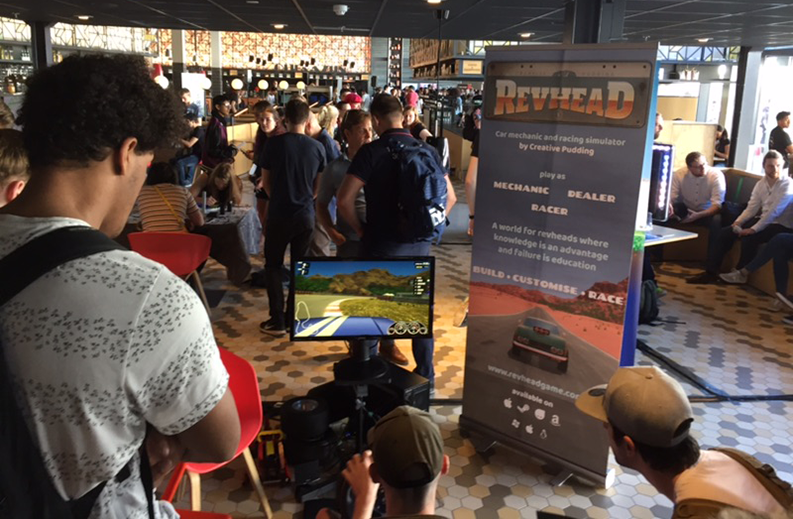 We are almost ready with our first game title: Revhead. For the latest news follow the game on Facebook and Twitter. We proudly present our new corporate video which showcases our technological background. From now You can find us also at facebook and twitter. Check our profiles for the latest news. GUIdo - Blue Elegant available! Our new plugin is available in Unity Asset store. This plugin brings an elegant blue GUI asset into your application or game. It's designed for Unity3D's Canvas system and it's fully compatible with any Unity5.x versions. It supports all platforms, including mobiles or consoles as well! New update available for our Unity3D plug-in: GUIdo - Blue Elegant. Creative Pudding Hungary Llc. is alive. As we are growing we made a new base for our game development located in Budapest, Hungary. Started with four people who are busy with our new game title. New update available for our Unity3D plug-in: Avatar. Creative Pudding proudly presents ProChart plugin for Unity3D. The plugin allows Unity3D developers to create graphs and charts within Unity3D projects. ProChart can render into the Unity3D built-in UI system or directly into 2D/3D meshes. We are busy with our Auxilium project which won a subsidy. Auxilium was created for helping disabled people to motivate them using combination of serious games, VR, AR and physiotherapy. Creative Pudding is dynamically growing since it's started. Today we announce that a well talented team CriticalFever joined to Creative Pudding with 2 new members, Maverick and Birdy. Both of them are veteran game developer with over +20 years of experience and the team has several iOS games and apps released on AppStore. We already worked together on several projects in the past and all of us believe in a better future merging our forces. Therefore, we decided to continue our ride under the flag of Creative Pudding. We also have two other members to strengthen our operation as well. Aniko who is a financial controller, secretary, PM and our new CFO. Kornel who is our legal assistant and our new investor. Welcome everyone in the team! Would you like to go VR? Creative Pudding proudly presents Elitac Tactile SDK for Unity3D. The SDK allows Unity3D developers to connect a full body tactile system and trigger on body haptic feedbacks from the game. Using the Elitac wearable system the player can feel the interaction with game objects and make the game even more realistic. The first version of the SDK is available at Unity3D Asset Store. Full Body haptic support, right from your game. Easy to use and quick setup time. Test application and documentation included. Avatar 1.1 available in Unity Asset Store! Creative Pudding proudly presents Avatar, a character package for Unity3D, which is now available in Unity Asset Store. Avatar is a package to control a character by user or script, using custom made biped animations and AI. The package main goal is to make it easy to control a player or NPC without knowing anything about animation, Mecanim, AI or scripting. It also provides an easy way to add extensions, which allows you to add new features and customize your own game to make it unique. My friend, ex-collegue joined to Creative Pudding to make it better. From now on, I am working only at Creative Pudding in fulltime. Creative Pudding has been created in The Netherlands.